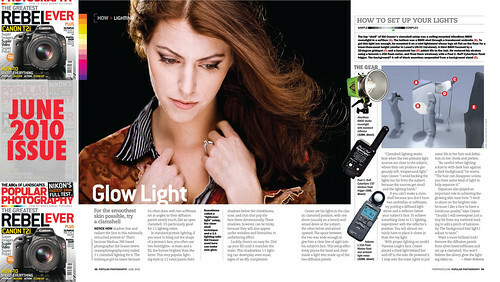 Its with total excitement that I share with you my first major national publication: a two page article in the June 2010 issue of Popular Photography magazine. In most of my work I use artificial lighting; usually either studio lights, or small "speedlights". I've never been much of a natural light photographer. I've always been drawn to controlling my light; to build or deconstruct my images by use of strobe lighting. I've even been teaching others who are looking to start the creative journey of adding artificial lighting in their photography. I'm a fan of head shots. I love shooting them for actors, musicians, and corporate works. I love the simplicity and cleanliness of a nice strong, well lit head shot. Which is why I got very excited a few months ago when Popular Photography Magazine editor Peter Kolonia contacted me after finding a head shot of Vanessa on my Flickr stream and wanted me to contribute to their "How To" section of Pop Photo. To see other head shots that I've shot with this particular lighting method over the years, check out this flickr set I've created. I love this particular lighting style because it is clean and very luminous. It makes the subjects glow. I'd also like to give a big congratulations to Vanessa, as I think this is her first appearance in a national publication as well!! The June 2010 Popular Photography issue is on newstands now! Check it out!